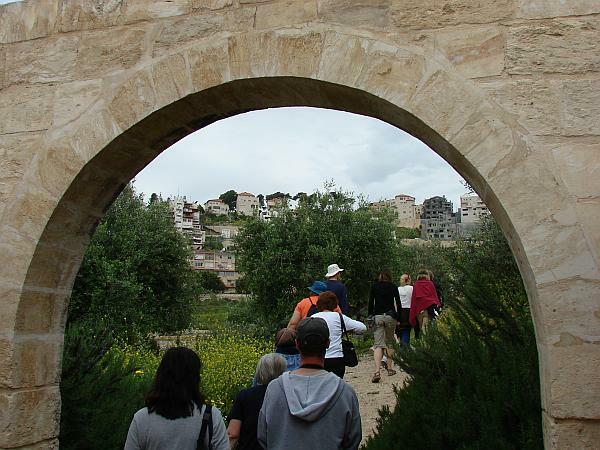 Nazareth is the city where Jesus was raised. 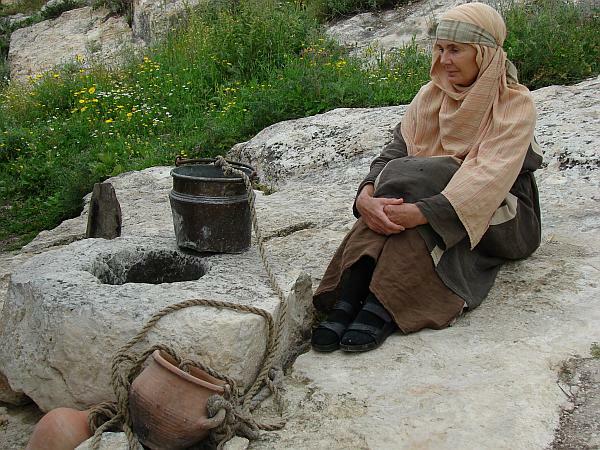 And in Nazareth today is an excellent Christian ministry that seeks to present Jesus’ message in Jesus’ setting. 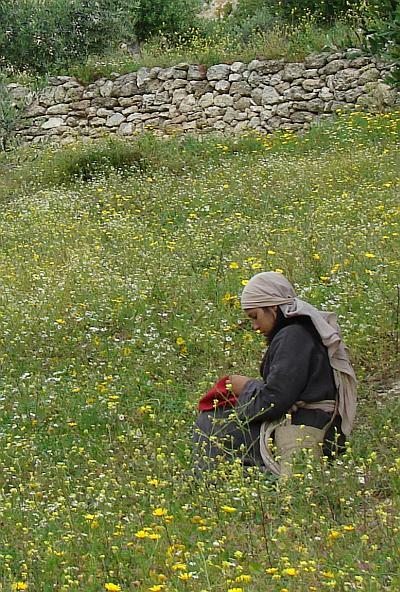 It’s called Nazareth Village, and is headed up by the Center for the Study of Early Christianity. If you ask me, it was one of the highlights of our trip. 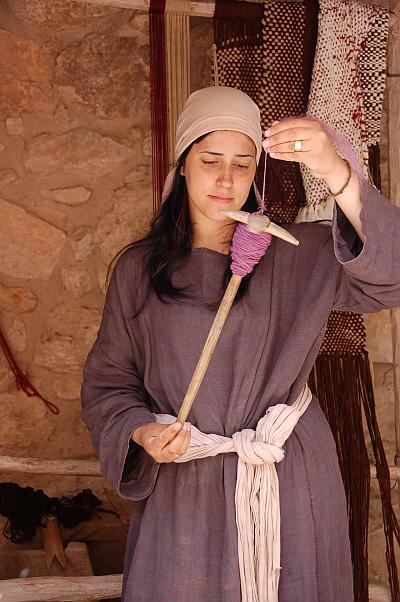 As a small model of a 2,000 year old Galilean village, Nazareth Village plunges visitors into the past by showing houses, farms, livestock and daily life/chores from the time of Christ. 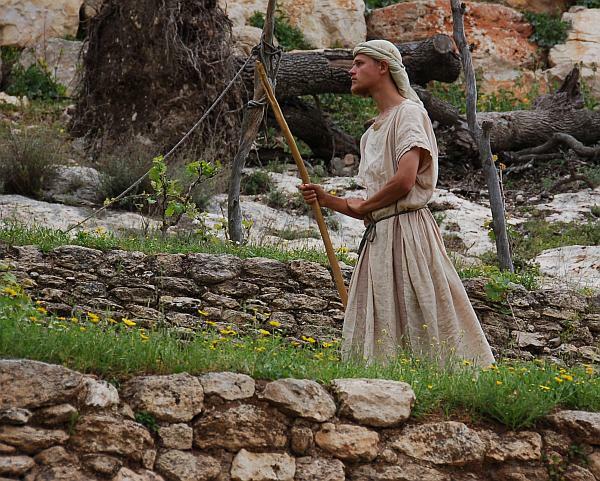 Actors dress the part and your tour guide explains not only the sights and sounds that draw you into the experience, but also focuses on Scripture and amplifies the meaning of various passages based on the experience. 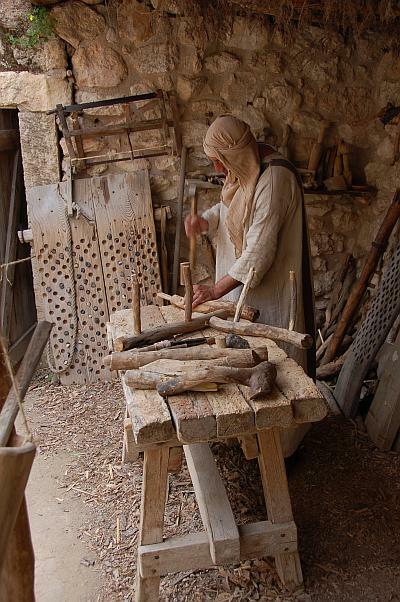 When preparing their mini-village, the builders uncovered a bona-fide vineyard, complete with winepress, watchtower, olive-crushing stones, irrigation system and ancient quarry, all dating back to the Roman period! How’s that for ‘luck’? 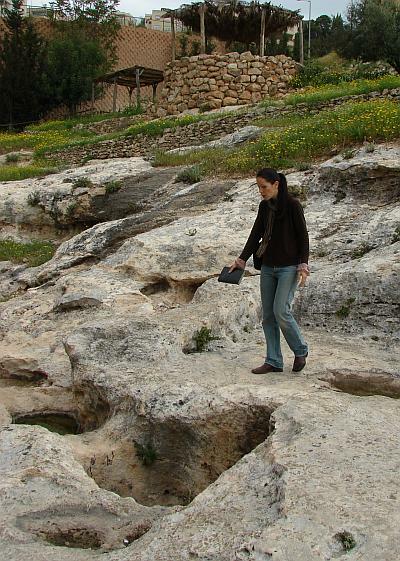 Here’s an example of terrace farming – a practice still in use today all over Israel. Because of all the hills and mountains in the region, almost all farming was “terrace farming”.To prepare a field, a farmer would build a series of retaining walls of stone in a stair-step fashion up a hill. Each terrace would only be a few feet wide – wide enough for a line of olive trees, grape vines or other crops. For each terrace, he would first lay a hard clay soil and then on top of that would add a layer of topsoil. Around the outer perimeter of the farm would be a path of hard soil or rocks so he could walk to his crop. It took a farmer about a full year to build and prepare a field. The purpose of using two different layers of soil is for irrigation. 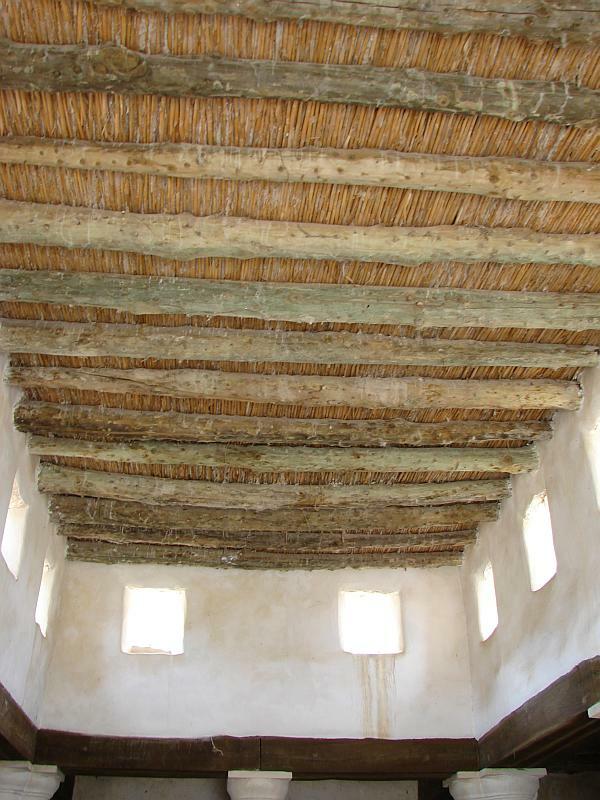 When the top terrace was watered, the hard layer of clay soil (a few inches beneath the topsoil) in each terrace would prevent water from being wasted by penetrating too deep into the soil. 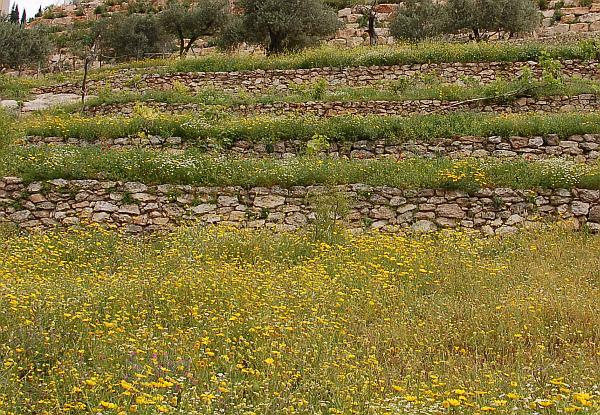 Instead, water would build up and spill over the edge of the retaining wall and flow down the hillside to each terrace, thereby watering the entire farm. 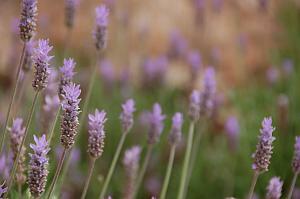 So in Matthew 13, when Jesus told the parable of the sower planting seeds on all kinds of soil, it’s not that the farmer was careless with his seed – it’s that the terraced field he was planting, by design, had lots of stones, hard soil and soft soil. It dawned on me that when you think about it in that context, the parable of the sower was such a common experience that I’m certain Jesus’ audience failed to see any deeper meaning. Their collective response was probably “No duh! And… so what? ?” It’s no wonder His disciples pulled him aside and asked what the parable meant. Considering that a small terrace farm would take over a year to prepare, no one in his right mind would buy one without examining it first. If it was built incorrectly or its walls were falling apart, the farmer would have a ton of work ahead of him just to get it ready to farm. So when the man receives his invitation to the banquet and replies that he has just bought a farm and must now go to examine it, Jesus’ audience knows immediately that the man is offering up a lame excuse to avoid the banquet. How often do we offer up lame excuses to avoid God’s call? 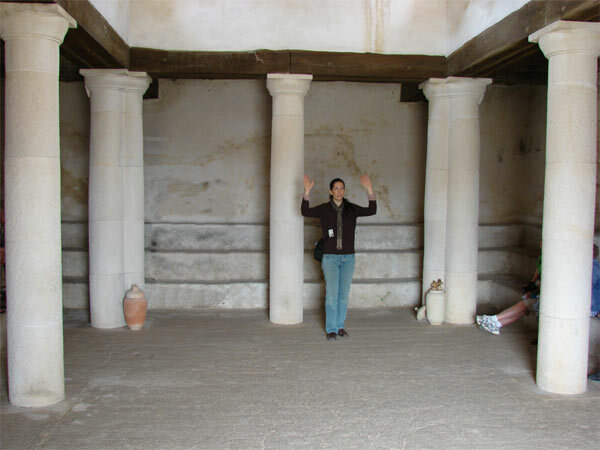 Along with a terrace vineyard, a farmer would have a wine press and build a watchtower to watch over his crop.Here’s our guide demonstrating how the winepress would work: grapes were put in a large basin (often hewn out of solid rock, much like this authentic winepress). Grapes were crushed with the bare feet so as to avoid crushing the seeds. Broken seeds make wine taste bitter. The grape juice would flow down a small channel into a larger basin and then would be collected and stored to turn into wine. The watchtower would sit high up on the hill and from this perch, the farmer could keep an eye on his crops and make sure people didn’t try to steal them. 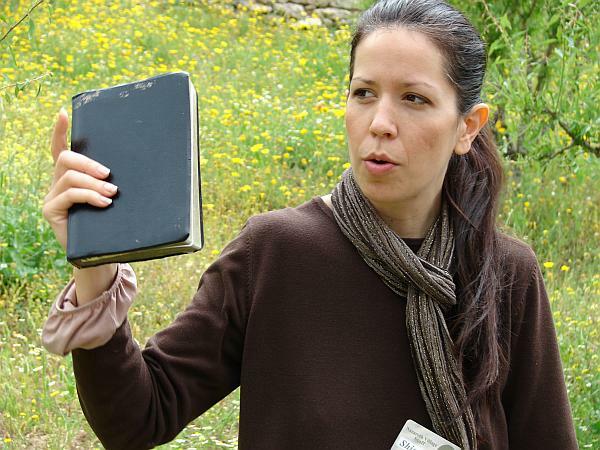 Jesus told a number of parables that related to a garden, sowing, watchtowers, etc. Here’s a shepherd tending his flock. The flock of goats are on a higher terrace, just to the left and out of view of the camera. A dry cistern is large enough to be used to, oh.. say, imprison a pesky day-dreaming kid brother wearing a flashy coat. 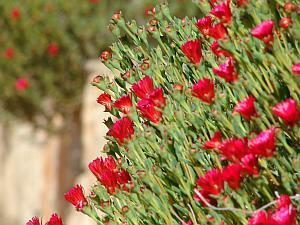 I don’t know what the flower is on the left, but the branch on the right is an olive tree. You can see the small olives taking shape.There are TONS of olive trees everywhere you look in Israel. 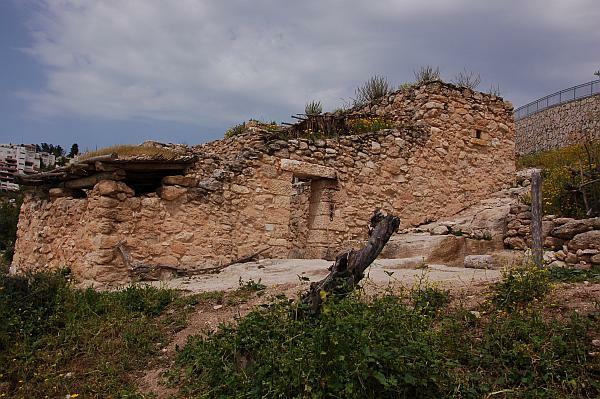 A typical 1st century home.Looks a lot like something from the movie “The Nativity Story”. Typical ‘living room’.Apparently your average home had two rooms: one living room and one bedroom. Everyone slept in the bedroom and ate, cooked, etc in the living room. The tour guide didn’t discuss bathrooms. Or maybe I was off taking a picture of something else when the topic came up. 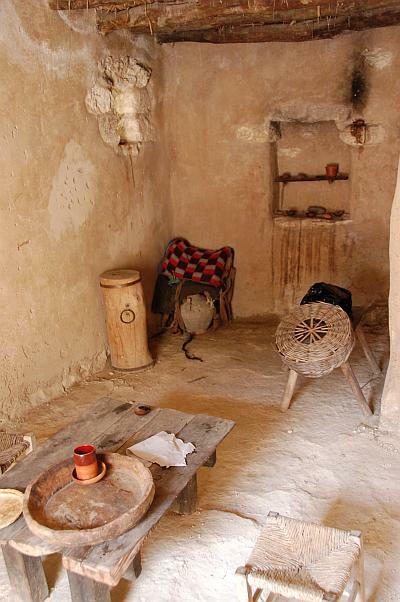 The small piece of pottery in the center is a lamp. 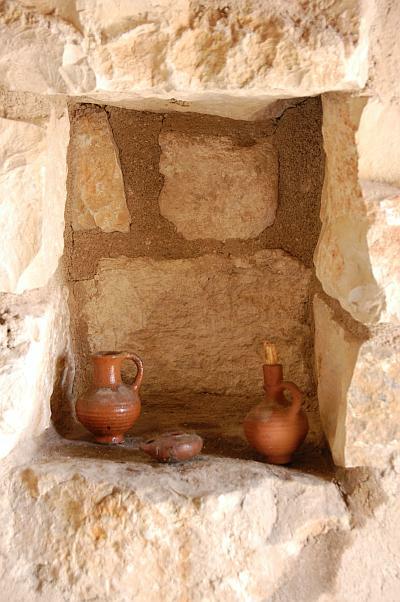 A typical 1st century lamp was usually no more than about 4″ in diameter. Not at all like the Aladdin-styled lamps you see in a Disney movie. 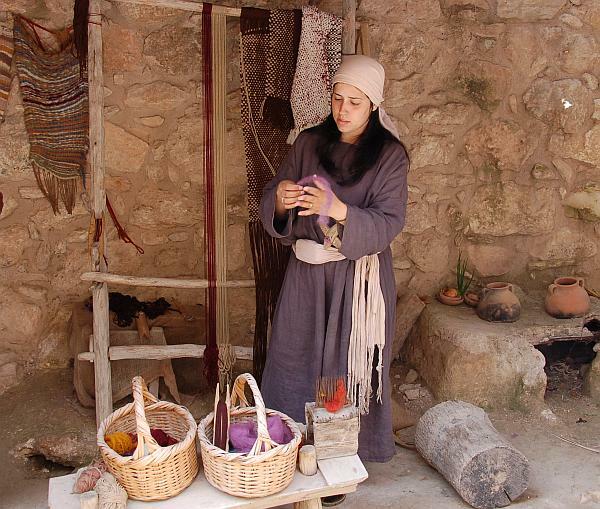 They not only made their own yarn from the sheep, but they made the dye and dyed it by hand too, just like they did 2,000 years ago. Snails produce the dark blues and purple colors. And various juices (from trees?) 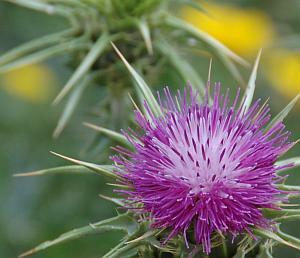 were used to produce the oranges and mustard-colored dye. Weird. Very cool! Here’s a carpenter at work. 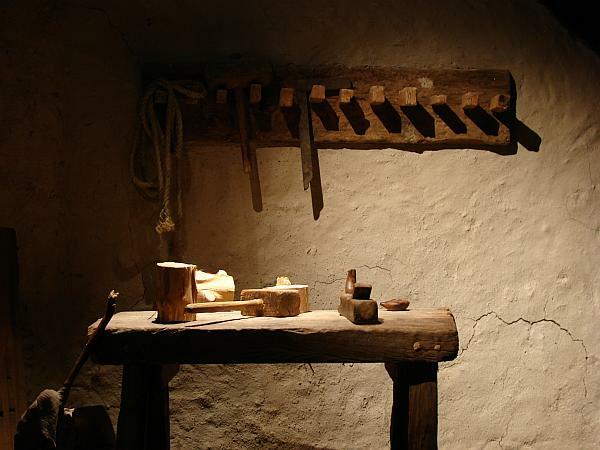 The term “carpenter” was used to denote either a wood or stone worker. 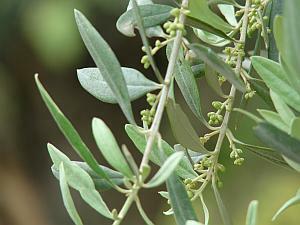 An olive tree. 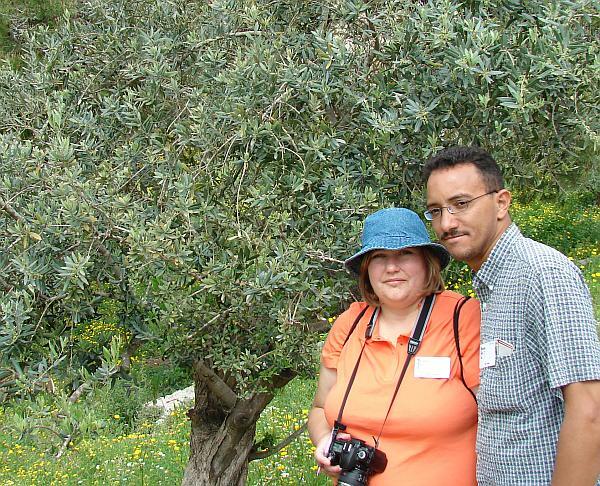 I didn’t know that olive trees can grow for several hundred years. When the olives had been harvested, they were placed in this stone trough. By pushing the arm around in a circle the olives were crushed by this millstone. I was surprised at how easily the thing turned.The olive pulp was gathered in bags and brought to the olive press. Several bags of olive pulp (the dark cylinder in the center-left of this photo) were laid on top of each other and then placed under the pressing part of the olive press. This particular press had 3 large stones. 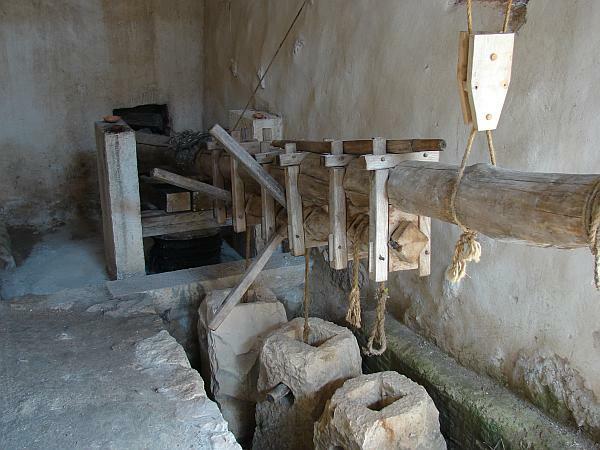 The first stone (closest to the fulcrum of the press) was used to squeeze virgin olive oil from the bags. This was collected in a basin under the bags and a new basin was used to catch the oil when the second weight was added to the lever. 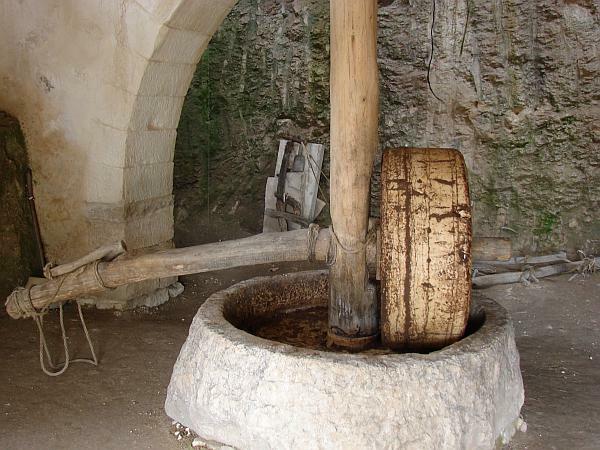 A third basin was used to collect the oil when the third weight was added.The virgin olive oil from the one-weight press was used for anointing heads. The oil collected from two weights was used for cooking, and the oil collected when all three weights were applied was used for lamps. I never knew that. That sent chills up my spine! I don’t know why, but the roof of the synagogue interested me.